"The customer had a personal motive for the murder. Eight years ago he was a civil husband of Maksakova." The murder of former State Duma deputy Denys Voronenkov has been contracted by the Russian criminal authority Volodymyr Tyurin, aka Tyurik, Ukraine's Prosecutor General Yuriy Lutsenko told a brifing in Kyiv on Monday, 9 October. Tyrin, who has an extensive criminal record and a known leader of a criminal group had a personal motive for the murder, the chief prosecutor said. "Eight years ago he was a civil husband of [Russian opera singer Maria] Maksakova, who at the time of the murder was the wife of Mr. Voronenkov. Tyurin agreed to finance and orchestrate the murder of Voronenkov in exchange for favors on the part of the Russian secret services concerning the control of criminal gangs in Russia and some former Soviet countries," Lutsenko said. The investigation established, Lutsenko said, that the mediator of the killing was Tyurin's son Dmitriy. The criminal group was headed by Yury Vasilenko and his aide Oleksandr Los. The immediate executor of the murder was Pavlo Parshov, his accomplices – Yaroslav Tarasenko (driver) and Yaroslav Levenets. All of them but Tyurin are the citizens of Ukraine. Tyurin Sr., Vasilenko and Levenets were reported in absentia about suspicion, their whereabouts are unknown. Los and Tarasenko are arrested, Parshov died in custody shortly after the crime. The Prosecutor-General's Office will seek the extradition of Tyurin to Ukraine, Lutsenko added. 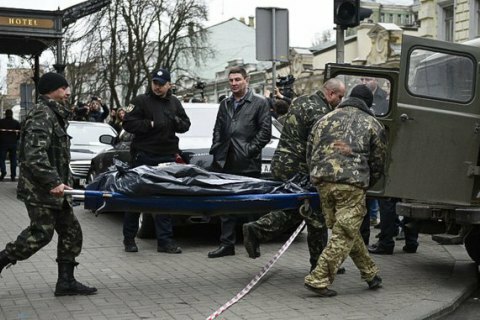 The former State Duma deputy Denys Voronenkov was killed in the center of Kyiv on 23 March. The murderer Parshov was heavily wounded by the former deputy's bodyguard and later died in a hospital.